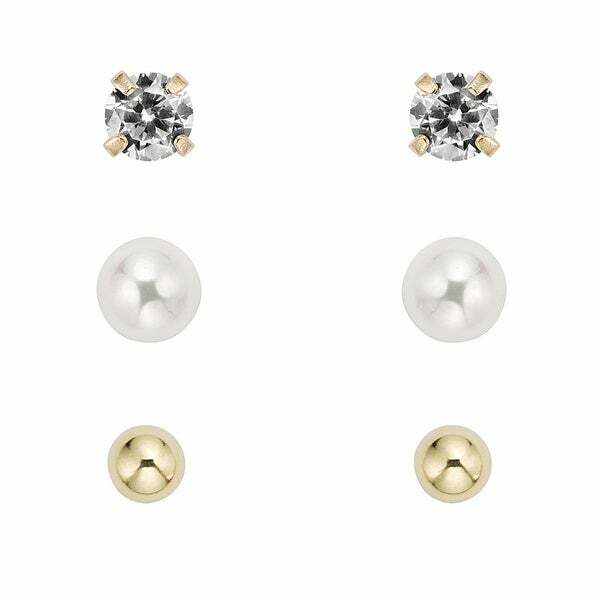 This pretty earring set for children features a pair of golden ball studs, cubic zirconia studs and round freshwater pearl studs. Each of these fine earrings is crafted of 14-karat yellow gold and secures with a butterfly clasp. All weights and measurements are approximate and may vary slightly from the listed information. Treatment code N (Pearl) and CR (Cubic Zirconia). See Treatment Guide for further information. Welcome any precious bundle of joy into your life with the gift of a baby bracelet. Whether it's an old family tradition or a new idea, the perfect baby bracelet is an endearing and long-lasting symbol of love. How to Buy Hypoallergenic Jewelry from Overstock.com. Our guides provide customers with information about how to buy hypoallergenic jewelry.